Walk down any high school hallway — or sit in a college adviser's office — and you'll likely hear a chorus of "Where are you going next year? What's your school choice? Where are you going?" That's what I hear in an adviser's office at McKinley Tech High School in Washington, D.C. The room is abuzz with activity. Students are filling out scholarship prompts, trying to access their financial award letters to inform last minute decisions and announcing their final college choice to anyone who asks. Alexis Liggins, a senior, is hunched over her laptop, putting the final touches on a scholarship application due tomorrow. She's committed to Florida A&M University — a highly ranked public, historically black university in Tallahassee, Fla. — and she's planning to major in biology. When she visited the campus earlier this year, she said she just knew. "It was a nurturing environment when we went," she explains. "It was like a big family." Later this week, she'll get up in front of her peers and say her school choice out loud. The relief of finally deciding is palpable in this room, but it doesn't mean all the anxiety is gone. For many, here and across the country, there are still a number of questions. The biggest: Can I actually afford to go? "I kind of like the idea that there's glorification of the academic. I think that's awesome," says Lindsay Page, an education professor at the University of Pittsburgh. She studies college access and says she's glad high schools have moved away from only celebrating sports. But decision day can be a bit misleading — especially for low-income students. "We know that plenty of students can look like they have it all together at the end of high school, and lots of those students don't successfully make the transition." In some places, nearly 40 percent of high school seniors never make it to campus in the fall, according to research Page has worked on. In so many cases, it relates back to money. "Oftentimes there's a big gap in between what students and their families are able to pay and what is their unmet need, basically what's left in their bill that they're supposed to make up," Page says. Alexis, the student who committed to Florida A&M, says she didn't get as much financial aid as she had hoped for, and she has to come up with about $20,000 — per year. She knows that $20,000 is a big number and that over four years, that net cost is actually $80,000. But she's determined that come August, she'll be soaking up that warm weather in Tallahassee. "I'm still gonna go," she explains. Her plan is to apply for as many outside scholarships as possible. "Every single day," she says. "During class, during lunch. During my sleep time that I wish I get." She says she'll work her grocery store job all summer and see if she can transfer — or find a new job — when she moves to Florida in the fall. Today is decision day for many high school seniors. It's when they commit to a college. They announce their decisions at school assemblies, and they send in financial deposits to hold their spots on campus. Elissa Nadworny of the NPR Ed Team has been talking to students about their decisions and the road ahead. JADA BOUIE: I, Jada Bouie, will be attending Delaware State University. Kayla, introduce yourself, sweetie. KAYLA RICHARDSON: I'm Kayla Richardson (ph). I will be attending the North Carolina Central University. BETHLAHAM ASEF: My name's Bethlaham Asef (ph). I'll be attending University of Southern California. 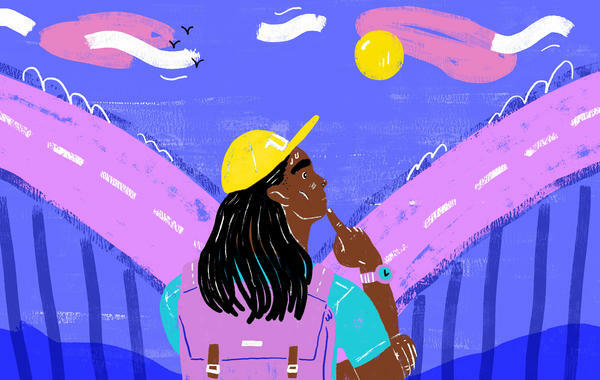 ELISSA NADWORNY, BYLINE: We're in a college adviser's office at McKinley Tech High School in Washington, D.C. And there's a constant chorus of, where are you going next year? Where are you going to school? Some are waiting on their financial aid award letters, and others are signing up for dorms. The room is abuzz. ALEXIS HIGGINS: My name is Alexis Higgins (ph), and I will be attending Florida A&M University in Tallahassee, Fla. - thank you very much - majoring in biology. NADWORNY: Alexis is a senior here at McKinley Tech. And when she visited the Florida campus earlier this year, she said she just knew. HIGGINS: It was like a nurturing environment when we went. It was like a big family. NADWORNY: Later this week, she'll get up in front of her peers and say her school choice out loud. LINDSAY PAGE: I kind of like the idea that there's glorification of the academic. Like, I think that's awesome. NADWORNY: That's Lindsay Page, a professor at the University of Pittsburgh. She studies college access. And she says she's glad high schools have moved away from only celebrating sports. But today can be a bit misleading, especially for low-income students. PAGE: They can say where they're going. You know, they're intending to go there in the fall. And then for a large share of those students, they don't successfully make the transition. NADWORNY: Her research has shown that in some places, 40 percent of high school seniors don't show up as freshmen in the fall. And the biggest reason - the money. PAGE: Oftentimes there's a big gap in between what students and their families are able to pay and what is their unmet need, basically what's left in their bill that they're supposed to make up. NADWORNY: I ask Alexis, the girl who committed to Florida A&M, about her finances. HIGGINS: My financial aid, it isn't that much. NADWORNY: How much money do you have to make up? HIGGINS: A lot, probably like 20,000, 20-something thousand per year. NADWORNY: Page has seen this before. That 20,000 looks doable right now. But come July or August, that 20,000 is a big number. And over four years, that number is actually $80,000. But Alexis, she's determined that in August she'll be soaking up that warm weather in Tallahassee. HIGGINS: I'm still going to go. I just have to do more on my side. NADWORNY: She just has to apply to as many outside scholarships as she can find. HIGGINS: Every single day during class, during lunch, during my sleep time that I wish I get (laughter). NADWORNY: She says she'll work all summer and get a job when she moves to Florida in the fall. Elissa Nadworny, NPR News. Transcript provided by NPR, Copyright NPR.